"Piercing the corporate veil has become the most litigated issue in corporate law today. In every case, the plaintiff’s intent is to acquire the personal and business assets of the company, and at least half of them win." 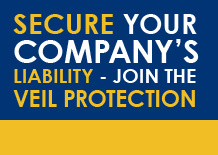 The corporate veil is the protection between your personal assets and your business assets. If you have a Corporation or an LLC you are required to maintain company records that prove there is a separation between yourself and the company. If you do not complete and maintain these documents, you will be treated like a Sole Proprietorship and that means you will be personally liable for the actions of the company. Many small closely-held Corporations don’t think they are held to the same standards as big companies. Quite the contrary. In the eyes of the law it doesn’t matter if you are the sole person on the board of directors, the only shareholder and the only member... it becomes even more important that you are following proper corporate procedures. Failure to maintain your corporate records makes you liable for the company’s actions and debts. You could also be held personally responsible for tax penalties your company took advantage of. You can easily assess your corporate veil's health by downloading and completing the Corporate Health Checklist. “I am not the Corporation (LLC), and the Corporation (LLC) is not me”. This phrase may seem simple, yet how many entrepreneurs continue to run their Corporation as if it were a Sole Proprietorship? The most crucial key in keeping your corporate veil in place, your assets protected, and your business out of jeopardy is corporate record keeping. Attorneys are able to pierce your corporate veil by proving that you and the Corporation or LLC are not actually separate from each other. They will strive to prove that you have been acting as a Sole Proprietorship despite being incorporated. It’s as simple as showing that you have not been maintaining the correct corporate documents. Issuance of stock certificates, member’s ledgers and authorization of loans, purchases of real estate, annual corporate meeting minutes, and corporate resolutions. These are all company records that must be kept up-to-date and in order.